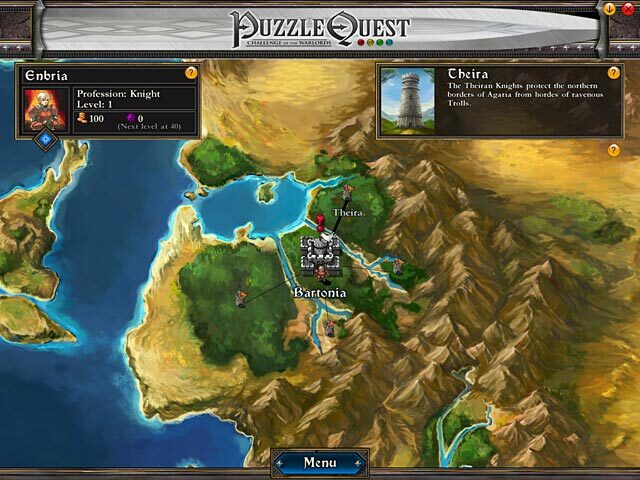 Puzzle Quest is rated 4.3 out of 5 by 17. Rated 5 out of 5 by Kikime from KEEP ON BRINGIN IT Fantastic RPG with match 3 battles, custom nameable characters of various types in male and female. There are free add-ons to this game that make it twice as long with twice as much to choose from but, even if you cant find them, this game plays the same way, though never having to play out the same.Everything is about the life affecting choices you make when you play. You choose your own destiny with a few possible successful endings, none of which mean your character can't keep playing. There are knights guilds to join, as well. You can play alone or against friends. You also get to choose, unless you make a mistake and lose their offer of friendship, which A I character friends you carry with you at any given time, after each is introduced to you, along the way. There are a variety of ways to make money and a lot of advancements to buy, as well as little objects. There are many different mini-games and exercises that advance the character or your kingdom. The game play starts out at a very low level but higher level characters have more exciting skills to show off and high stakes.The storyline is full of romance, adventure, and intrigue. 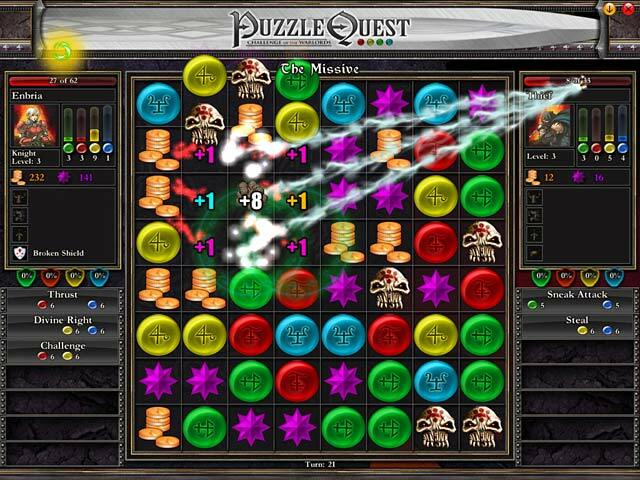 Rated 5 out of 5 by R33D3M33R from The best match 3 RPG out there Puzzle Quest is a excellent choice for match 3 players which also love RPG games. The gameplay is divided into two parts. On the map you travel between cities, buy items, collect gold, get quests, spend skill points and so on. The other part is battle which is a match 3 duel between you and the opponent. You match gems to get mana (colored gems) for spells or attack directly (skulls). There are several classes available which have different spells and this also holds for the enemies. The battles are therefore very different, and since you and the enemies can have different items and resistances, you have to adapt the strategy for each enemy. The story is full of clichés and with all the sidequests it lasts for 20+ hours. In my opinion, the story is stretched too much with unnecessary repeating tasks, and it should really be 10-15 hours long to be perfect. The game has some annoyances: 1. the AI cheats, and it cheats a lot! It will get insane combos and it might beat you when you at least expect it. However, after defeat, nothing is lost and you can try beating the enemy again. 2. When traveling, you will encounter enemies and you will need to battle them to pass. Since they appear really often, you will quickly get annoyed. To overcome this, capture a mount ant train it, then you will be able to avoid battles. I highly recommend this game to RPG lovers, but others might want to stay away from it, since is pretty complex. Rated 5 out of 5 by BlazeDuskdreamer from Awesome! So glad I found this game. It's a blast. I am liking it far better than a popular wizarding MMORPG I've been playing. Getting to make decisions that effect which way the story goes utterly rocks. Rated 5 out of 5 by Alana_danes from Best Match 3 Game I love this game. Who would of thought mixing RPG with a match 3 would be so fun. I thought epic fail at first then I played it and have not stopped. It all fits together real well and I like the added spells and story over say Bejeweled. Another aspect of this game I like over Bejeweled (And others.) is the fact that the game does not end when there are no other moves. The board just resets and you keep going. Bejeweled could drive me nuts. The story is rather simple, the games weak point IMO, but it's good enough for this. If you like bejewled and other match 3 games give this a go. I think you will be wanting the sequal as well. Another great game though I found Galactic dissapointing. I have this game for both my PCs and the XBOX and so does my partner. It's that fun. Rated 5 out of 5 by bwillia from Great game I luv, luv this game, I still play it and every time I hit a different challange even after all this time (I purchased in 2010). Clear and crisp artwork, great characters, very challenging. What more can I say, if you love interactive games then this one is for you, I hope the developers come up with a Puzzle Quest 3 in the very near future. 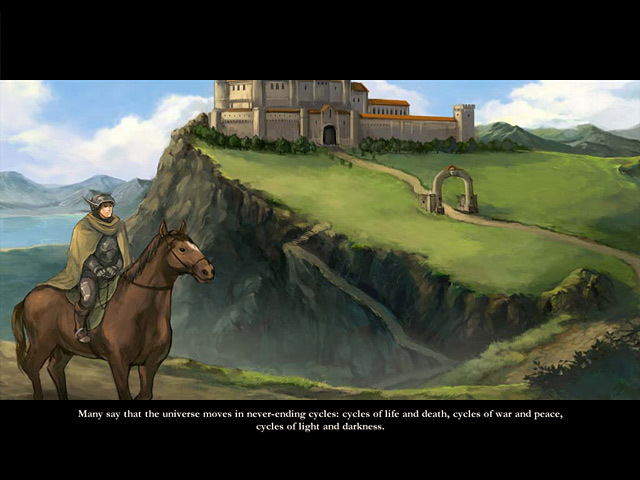 Rated 5 out of 5 by juliabennett from Do you like Dungeons and Dragons? Then this is the game for you. It has a lot of the DnD elements but instead of random die rolling, you are matching 3 gems. There is a lot of strategy involved. And it's unlike any other game I've played. Hours and hours and hours of game play. In fact, I've been playing for 20+ hours and there is no end in sight for the game. Great fun! Rated 5 out of 5 by LikaLaruku from Lord of the Match 3. These games were even good enough to get reviewed by gaming magazines that normally abstain from mentioning casual games. It's not terribly short either; it's one of the longest lasting games on this site (because it's half RPG, no doubt). This is the only Match 3 I've tried with enemies trying to stop you that requires completely different strategies per different type of opponent. This game is heavily inspired by Lord of the Rings & Dungeons & Dragons, so if you enjoy games like Aveyond & Match 3s, then this is right up your alley. The storyline is refreshingly non-intelligence insulting & there's a reason behind everything that's done. Like most casual games, the soundtrack is limited to only a few songs, but I never found myself turning the BGM off, it's quite pleasant actually. This game has a sequel with no demo & it's toted as being even better. If you like this, just go ahead & buy the other. Rated 5 out of 5 by jazzaxe from Just like my gameboy game, only bigger!! I got hooked on this game on my gameboy. Needless to say I was very excited to see it show up on Bigfish. I have to say my only disappointment is Bigfish has not released the "expansions" with the first Puzzle Quest unlocking additional story content and new playable characters which the smartphone apps have. Can this be something to look forward to in the future??? PLEASE?! Rated 5 out of 5 by Puzzlequestlover from Best Game EVER!!! 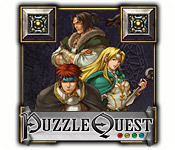 Puzzle Quest is, by far, the best game I've ever played. It's like a child's version of any D&D game. Go on quests, find companions and battle monsters like orcs, spiders and undead!! Play wizard, fighter, druid and more!! So amazing!! And it's not at all scary. I would highly recomend this game to any child who loves adventure. I LOVED it and you will too, play Puzzle Quest today! !